It’s been gloomy here on the blog and sad events have kept me from talking about my new home. That’s a shame because it’s a wonderful place, only three miles from my parents, Uncle Bob, and The Farm. I’m right in the middle of what I’d describe as a “family compound.” I’m surrounded by my landlord’s family and sometimes, the best part of the day is when I see his father drive by in a golf cart to go and visit his grandson a little further out on the compound. My apartment is spacious, sunny, and bright, all in a country setting. There is even a pond just outside my kitchen window. It’s sort of like the See Mint Pond that I used to look out on when I lived at The Coop, only no one lounges around it in lawn chairs. The pond is a good barometer of the weather. 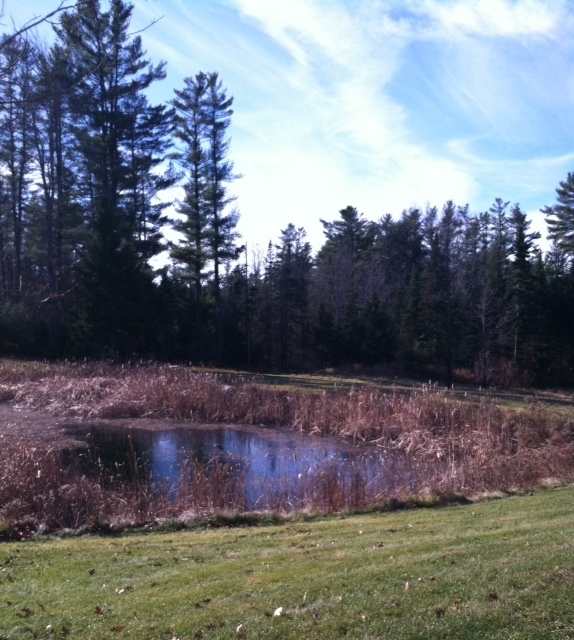 If it’s windy, I can see it on the pond’s surface and in the grasses surrounding it. I can see the rain drops. Lately, I’ve been able to tell how cold it is by the amount of the pond’s frozen surface. For the first month I lived here, there was only one thing wrong with the pond. Drifting around the edges was a yellow “thing” that looked like a large plastic bag. At first, I didn’t pay much attention to it. Maybe it was some kind of “pond freshener.” Sometimes it was on the left side of the pond and sometimes it was on the right. I thought about going down and investigating, but I didn’t want my landlord and landlady to think I was snooping or getting into things on the compound that were outside the realm of my lease agreement. What if I fell in? I could have said something, but it seemed so petty. I didn’t want anyone on the compound to think I was a pain in the BLEEP (or a PITA), nor did I want them to think I was a Type A fuss budget. Easy enough. Unfortunately, none of the houses on the compound were selected for holiday house tours and I can’t help but wonder if the bag in the pond had anything to do with it. We’ll just have to go snooping around some other houses this holiday season and see what other people do with their ponds and palaces. The Portland Holiday Home Tour features five (5) historic West End homes. Visit today and tomorrow, November 22, 2013 and November 23, 2013 only. Friday’s hours are 10:00 a.m. to 4:00 p.m. and Saturday’s hours are Noon to 6:00 p.m. The tour starts at Mercy’s Fore River Hospital. A portion of the proceeds benefit Gary’s House, Mercy Hospital’s home for families in medical crisis. For more information, click here. Tickets are $30 at the door. This entry was posted in Talk of The Toile and tagged family compounds, good neighbors, ponds, Portland Holiday Home Tour. Bookmark the permalink. What if you fell in? You’d get yourself out again. Or you wouldn’t. Silly to leave that bag when you could fix it yourself in five minutes. Keep your weather barometer clean and sightly. Now, if you want a pond freshener, you need ducks. If you want a security system to go with it, you need geese.